Have you ever watched a football game on tv and heard the announcers talking about the X Y Z receivers? Jump on any coaching forum or watch any video with a coach drawing plays and immediately see these receiver terms. What are the x y z receivers? The X Y Z receivers line up based on their positioning. Z is typically the wide receiver off the line of scrimmage. The X receiver is on the line of scrimmage. Last, the Y is the tight end. These receivers typically play into all types of systems – whether it be a ground attack, heavy RPO system like Oklahoma runs, or a pass heavy offense. Why Do They Call The Receivers X Y Z? As passing schemes became more complex, coaches started to revert from saying “wide receiver, slot receiver, or wideouts”. Coaches had to start labeling receivers that correspond to their position on the field. Interim head coach at the University of Maryland, Matt Canada is also famous for his motions and shifts. Offensive coordinators will often create confusion for the defense by motioning and shifting. Now that we’ve laid the foundation of the receivers, let’s take a look at who is often targeted when these letters are named. This was a staple in the West Coast Offense. If you’re unfamiliar with the West Coast system, learn more about it here! Positions were often named by location. For example, it was common to hear “flanker, split end, wide receiver or tight end”. However, as offenses got more complex and diverse, coaches started to create systems where they could change routes on the fly (for example, change what the Z receiver is doing just by saying “Z-Slant” or “Z-Out”). Below is an image of a basic formation we’re going to break down to help identify the X Y Z receivers. X – Let’s start with the X receiver. This receiver is typically on the line of scrimmage and flexed out wide. Often times a teams #1 receiver is the X receiver. Z– The Z receiver, which was previously known as the flanker, lines up off the line of scrimmage. This player can motion in and out of the formation. These players are often speed players that don’t have to worry about an immediate jam from a defensive player. Y – The Y receiver has grown popular over the years (especially in the NFL) as the “tight-end” position. The ability to pass catch as well as run block has made an immediate impact on the field, as its a matchup nightmare for linebackers. We often see this position lined up next to the tackle or slightly flexed away from the tackle. What About B F and H backs? This is where things can get tricky. depending on the play call (as well as the coach’s system) the second running back in the backfield’s letter can change. Let’s break it down! B – Line up as a true fullback. We often see the B in I-formations or any type of power formation. 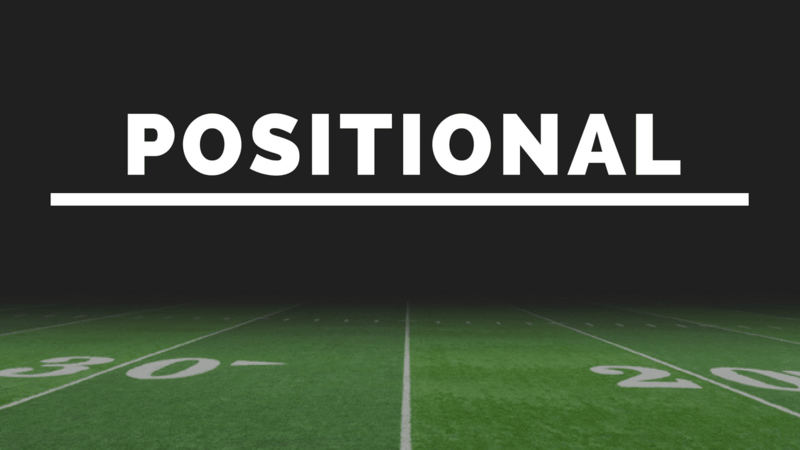 The fullback position has become less popular with the innovation of the spread offense. F – The F , or the offset fullback is still responsible for blocking but is a bit more athletic to leak into the flats to catch the football. H – The H position is becoming increasingly popular, as more spread offenses are emerging from youth to pro football. The H position can line up anywhere between the tackle or flexed out. The H-back has become wildly popular over the last 8 years. The perfect example is Rob Gronkowski. Having a player with tremendous size and speed, it puts defenses in a bind – leave a linebacker on the field to cover him or a nickel back? Why Is The H-Back Growing In Popularity? In a traditional offense, the tight end is often used in run blocking sets and the occasional play action route. Players like Gronk, Kelce, and Olsen are big enough to run block in a physical manner, but also athletic enough to catch passes in the open. Defenses are now adjusting by drafting bigger stronger and faster outside linebackers that can play all 4 downs. This also, is a direct correlation to why people say the “fullback” position is dying. H-back’s give teams more of a diverse capability to have a blocking-like position in the game to run plays like power, as well as being able to spread the field in the passing game. A few fullback’s left in the NFL are guys like Anthony Sherman, James Devlin and Kyle Juszczyk. These players are critical pieces in the system that they play in. As the H-back position becomes increasingly popular, some experts believe the fullback position will eventually die off. If the game continues to innovate, we may see a new letter position become the new stable in both the run and pass game. What do you think will be the new position that becomes increasingly popular? Will there ever be two quarterbacks on the field at the same time consistently? Leave your comments below, we love to hear new innovative ideas! These letters can often change based on the coaches system. It’s always good to keep an open mind when learning these systems as they may change as the game evolves! Do these letter schemes ( X Y Z receivers) fit with what you learned or are currently coaching? If not, we’d love to hear the different variations of your scheme! Visit our football blog for more football content!